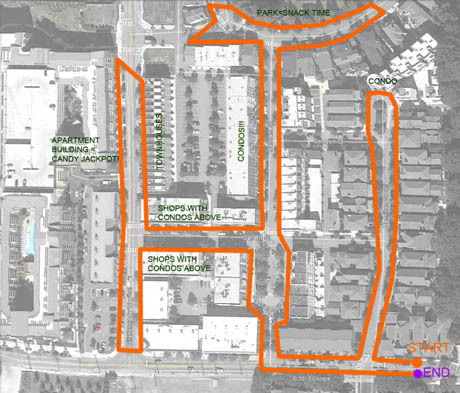 Just in time for those of you planning to head out trick-or-treating tonight, architect and planner Paul L. Knight and his colleague Kevin Clark have conducted a series of analyses of the impact of urban design on your sugar haul. 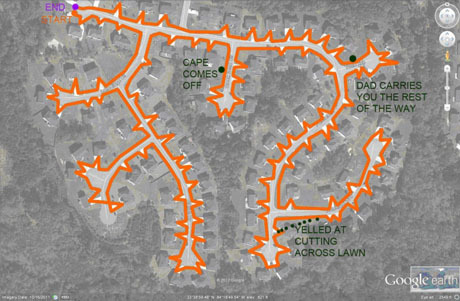 IMAGE: Conley Creek Subdivision, Conley, GA, analysed by Paul L. Knight and Kevin Clark in terms of Halloween-onomics. Knight and Clark’s metrics include “Potential Candy Score” (based on the acreage of your target neighbourhood multiplied by the number of houses per acre, families per house, and an informed estimate of both candy-giving families and candy-pieces per family), “Candy Density” (potential candy score divided by acreage of target neighbourhood), and “Trick-or-Treating Time” (a straightforward calculation of the route length in terms of a child’s average walking speed in feet per minute). Candy lovers know that all you need is a costume and a bucket to satisfy your sweet tooth, but in order to maximize a Halloween outing one must focus on the numbers including route efficiency, candy distributors per block (typically dwelling units), and “candy density” (candy pieces per acre). Equipped with these formulae, Type-A parents and sugar-obsessed juvenile maths geeks still have time to data-crunch their city in order to find those neighbourhoods whose layout offers the most sugar for the least investment in terms of time and energy. IMAGE: Glenwood Park, Atlanta, GA, analysed by Paul L. Knight and Kevin Clark in terms of Halloween-onomics. In short, by favouring gridded streets over cul-de-sacs, and townhouses or multi-family buildings over single-family homes, especially those that are set back from the street, urban ghouls and witches could earn triple the treats their suburban cousins do in the same amount of time. Though some may quibble, citing apartment buildings’ time-sucking doormen or less-likely-to-be-at-home inhabitants, it seems as though, when it comes to opportunity maximisation, urban density wins on calories and cavities as well as careers. Visit Knight’s entertaining post for the full analysis, which I found via @sarahrich.